"The inspiration of the Bible provides a foundation for our understanding of the reliability of the divine revelation in Scripture. It is uniquely inspired in a way that is different from other writings or works of art. However, this does not mean that the Bible is infallible or inerrant, so that it is incapable of misleading and contains no human error. Whereas we believe that the overall message of the Bible is inspired and reliable, each individual passage must be read and interpreted carefully, in context and with careful reference to the whole of Biblical truth." This can be wrongly understood as meaning that parts of the Bible could be misleading. 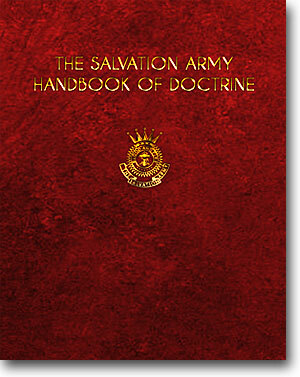 "We believe the message of the Bible is inspired and reliable. However each individual passage must be read and interpreted carefully, with context and with reference to the whole of Biblical truth. We affirm that we can rely upon the Scriptures for instruction and guidance in matters of divine truth and the Christian life, because in Sripture we meet the Word of God himself, Jesus Christ. The Holy Spirit who inspired the writers also illumines those who read its pages and leads them to faith." The children in the Latvian village Sarkani would rather spend the least amount of time at home. Authorities stashed them and their alcoholic parents in the battered housing blocks. Now, the kids got a house. - All those who live in Sarkani are poor families with severely alcoholic parents. The government has moved them there because their parents have not paid their bills and the rent where they lived, says Karina Kozlovska, one of the cadets at the Salvation Army Officer Training School in Latvia, from the front seat of a car with the Army logo. We drive past the deep forests and beautiful grounds with proud spikes. The asphalt is mildly bumpy. The atmosphere in the car balanced. What will wait at the end of the road? The 70 people who live there, are divided into eight apartment houses from the Soviet era. None of the apartments have electric heating, and the water is just rusty and cold, says Karina. The authorities do not believe that there is hope for those who live in Sarkani. When the Army asked to rent an apartment there, got the answer: "The people here are hopeless, why bother?" On the ground floor of an apartment house in Sarkani the sound of a car is heard driving across the tarmac. Children pop up from the game and run out as fast as they can. They recognize the logo on the side of the car that is getting closer. They eagerly put themselves where they assume it's going to park. They have a visitor! The Kazakh woman they see as their own mother, the Salvation Officer Aizan Konovi, picks up one of them. The Training Principal at the Norwegian School School for Officers Training is getting out of the car and smiles at a little girl. - Laura! says the girl as she meets his gaze. Major Frank Gjeruldsen point to himself. The children show the way into the dirty beige apartment house where the Salvation Army, after much trouble has been able to rent two apartments. We open the door to a large, colorful room full of toys. A girl with a bag full of marbles around the neck stretches out her hand, grasps it and pulls it back and forth like a saw, keener and keener asthe laughter rises. My name is Karina, says the ten-year-old and smiles, before she lets go and turns our attention to the football table. The competition between the Norwegian cadets and the children from Sarkani has started. In a few months' time, the game and all the other toys will move a few hundred yards further up the street, to a house that the Army has bought them. What remains to make the house ready is just the decor and some crafts. The brick houses in Sarkani were built and used as military housing when Latvia was under Soviet occupation. When the country became an independent state in 1991, the houses remained vacant. "The Latvian authorities used the barracks by copying a Russian model in which social problems are hidden from the outside world," writes Sven Ljungholm, an American SA soldier. "In Sarkani alcoholic Latvian families are hidden from the public and their dependency is removed from the Latvian society. Around thirty families live in unheated houses that have only the most necessary equipment. A tractor is carrying timber from the forests nearby, so that the families will have wood for heating. Many of the adults do not bother to fetch firewood and heat up the apartments, so the children are suffering when parents are under alcohol intoxication, "says Sven who has been involved in helping the children in the village. Along with Salvationists who live in the UK, he has arranged Christmas parties, helped with the refurbishment work and helped children and adult with health care. The Salvation Army came to the village in 2007, when the Salvation Army officers Aizan and Sergejs Konovi was ordered to go to this and another poor village. Sergejs had worked for the Salvation Army for a few years, but for his wife, Aizan, Sarkani and Seda were the first appointments. It came as no surprise that it was where they were going. - When I asked God how he wanted me to serve Him and the people, he showed me a picture of Sarkani, though I had not been here. I am grateful that I get to tell people about Jesus and show them that they can trust him, telling Aizan, who has converted from Islam. When they reached the village, they were shocked. People who met them drank large amounts of alcohol. Citizens did not spare the curse words. Hygiene was lousy. The children were dirty and had fleas. - Is it really possible to live like that? I did not understand it, says Sergejs. He himself had had alcohol problems earlier in his life. In the beginning, some of the parents were aggressive against the two officers. Negative comments rained down on those who had come to help. The children did not behave properly either. - At first I cried every night. It's hard to work here, but God gives us strength, says Aizan. Despite opposition Aizan and Sergejs continued to offer kids food, a place to play and a place where they could hear about God. After a while the children were so attached to them that it was hard to go home. - We're here four days a week. We do not count hours, we will be happy here when we have free too. It is important for us to show the kids that someone is fond of them. Most of the children are under 12 years of age. They go to school together with other kids in the adjacent villages. Their daily lives are not uncomplicated and often they are being bullied. At one point the other children did not want to play with the children from Sarkani, because they had not washed themselves. They were placed in a corner of the class room while the other pupils had their lunch. The parents could not afford to pay for them. The little money they have goes to buying alcohol. Now the children receive money for lunch by the Salvation Army (translators correction). After the school they run to the army and they stay there until the last light is turned out and the door is being locked. Some of them is frequently running home in order to check that the parents are doing well, that they are still alive or to help them go inside if they have been lost outside without clothes due to intoxication. The kids have been taught that they all are part of one big family and that they therefore should treat each other well and hot hit each other. - We have taught them that if they have an argument they must square the conflict make peace and stop quarreling. They forgive each other says Sergejs. The children are coming to services every Saturday. Now approximately 10 of them are junior soldiers. Once a week they are brought to the farm that the Salvation Army has inherited from Olof Palm, where they can take showers. - The children would like to shower for one hour each. When the Childrens house will be ready they will have their own shower there says the children- and youth worker Olesja Kurpa with a smile. They want to send home food with the children but they have realized that it is not a good idea. - I believe that the children in Sarkani must be separated from their parents, and for example stay in a childrens home, but they would probably have run home again to watch over their parents. However, the children have not planned to run home right now. Now they are busy playing with the guests from Norway. A little boy is creeping into an orange coloured chair covered with a stiff fabric. He is covering himself and is sitting inside the cocoon still and quite as a mouse. A minute later the cover is taken off and the heart shaped birth mark is revealed bore the smile is getting all our attention. Behind us one of the other boys are jumping on the trampoline with one of the Norwegian cadets, and children and cadets are puzzling on the floor. A girl with her hair in a long braid is standing by the window looking out. - My name is Amanda, I am 10 years old and I have always lived here, she tells. - I live here with my parents. During a day I am terrorising my neighbours and I am playing around with my friends. Another girl Adriana, is peeking under her clown sweather. - What are you dreams? - She has the very best marks in school. Outside the house there is a small girl sitting staring down into the grass. She bends her head so the golden brown pony tail is swagging to the front covering her face. Olesja goes to her, says something which makes her look happier for a moment and she asks if she can sit in her arms. - This is my little princess says Olesja and takes carefully away the hair from her face. Beside them her brother is walking smiling. - I believe God has given him the ability to be joyful in spite of the difficulties. Another girl Veronica has lifted up her little brother on her back. She is holding his legs while she slowly walks towards the Children´s House. - Can you describe a normal day here? - I wake up myself. I make my bed and make some food. Then I go to school. When I come home I spend some time with my parents if they are not workign. They work with tree planting in the forest, she tells. Some hundred meters away there is what a couple of months ago was a tumbledown storage barn with moss on the roof. Now the walls are recently painted, the roof is new and everything inside is replaced. Next project is to fix the entrance. Two boys are looking in through the window anxious to see what has happened since last time. Another boy accompanies Frank as he enters the house. - So this is the new house says Frank. Exited he is checking out the new bathroom, with water, a separate shower and a washing machine, the new kitchen, the library and the play room where he and the other children will be razzling around in a couple of months. The goal is that the house will give the children a safe and good place to be. They will have a place where they can do their homework, play and do handicraft, to paint and to cook together. They will shower here and learn how to clean a house so that they can see that you can create a tidy place and a good environment also here in this village says Sergejs. It was Rut Baronowsky one of the leaders for the Salvation Army in Latvia, who had the idea of the house. The Salvation Army in Sweden has financed it. The hope is that the house also will help the adults in the village. - Children should grow up in a loving atmosphere. We are dreaming of a situation where the parents would take better care of their children so that they do not make the same decisions and do the same mistakes as their parents, but that they choose a different life, says Aizan. Sergejs and Aizan think that it is meaningful to be in the village. 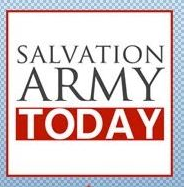 Adults have now also started to visit the Salvation Army in order to participate in the worship services and to receive food from the soup kitchen. - I have seen some of your paintings and they are smashing, he says to the children. - Sergejs has told me that you are also helping out making the Childrens house as good as possible and that is so good! Elin Kyseth, one of the Norwegian cadets is impressed and moved by the work of Sergejs, Aizan and Olesja in Sarkani. - This ministry gives the children a new chance to be children as God intended it to be. You are making heaven on earth in this community she tells them. Karina, the girl with the marbles around her neck is approaching one of the Norwegian guests to say good bye. She is holding something in her hand. She asks the guest to open her hand, the one she shook one hour ago. Carefully she places a transparent marble with a blue, green and red wave inside in her hand. Without saying one word. - My dream is to be a servant of God and to have a nice family, says Karina. Almost a year is gone since we visited Sarkani. The Childrens House is now ready and it has already been in use for several months. The entrance has been painted red and there is an Army shield under the ridge. Under the entrance roof there is lots of space to have a grill party on a rainy day. Inside the computers, the toy fire engine, the football game from the play room and the cross from the worship room in the old apartment have now move in. Besides there is now a modern kitchen and sanitary facilities. Life has got a safer frame. Please support Sarkani? Use gift account number 3000.15.07334 (Salvation Army in Norway, and mark the gift with “project 303100, Sarkani”. Read more about Sarkani of Ruth and Peter Baronowskys blog www.rupeba.se or Sven Ljungholms blog www.hamiltonsa.blogspot.com.